Three nineteenth-century Corfu ketuboth illustrate form following life. The second largest of the Greek isles, Corfu, both island and city, was the home of an old, cosmopolitan Jewish community. The twelfth-century Jewish traveler, Benjamin of Tudela, found only one Jew there in 1147, but not long thereafter when the island came under the sovereignty of the Angevin kings of Naples, a large number of Jews settled there. Over the course of time three Jewish communities were established on Corfu: Greek, Spanish, and Italian. For a time each retained a separate identity with their own synagogues, burial places, customs, and liturgies; but gradual, then more rapid integration took place, especially in the nineteenth century. That century also saw great discrimination against and oppression of the Jews. Under French rule (1805-1815), as the Jewish Encyclopedia states, "the Jews enjoyed all the rights of citizenship, and their rabbi ranked with the Catholic bishop and the Orthodox archbishop. But when, together with other Ionian islands [Corfu] formed a republic under the protectorate of England (1815-1863), the Jews were not only forbidden to practice in the courts, but lost all their rights." The rights were regained when Greece annexed Corfu in 1863, but the following year Jews suffered from anti- Semitic riots which caused many Jews to leave. In 1891 a "blood libel" accusation led to an even greater exodus. On the third day of the week, the third day of the month Mar-Heshvan, in the year of creation 5573  and 1745 years since the destruction of the Second Temple, may it be rebuilt soon in our time, and in the time of the whole House of Israel, Amen! as we are accustomed to count time here in the isle and city of Corfu, may the Lord protect it ... we the undersigned bear witness that ... the young man Yani Osmo, the son of the honored Raphael De Osmo, said to the virgin ... Esther, daughter of the honored David De Mordo ... be thou my wife. Corfu ketuboth are distinguished for using double dating, the year since creation and the year since the destruction of the Temple. 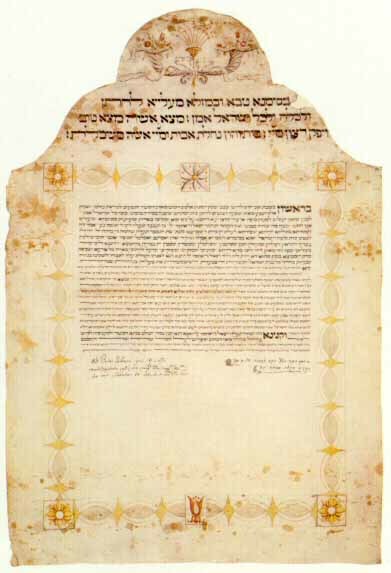 The two dates on this ketubah read at the wedding of Yani, the son of Raphael De Osmo, and Esther, daughter of David De Mordo, are 5573 and 1745. 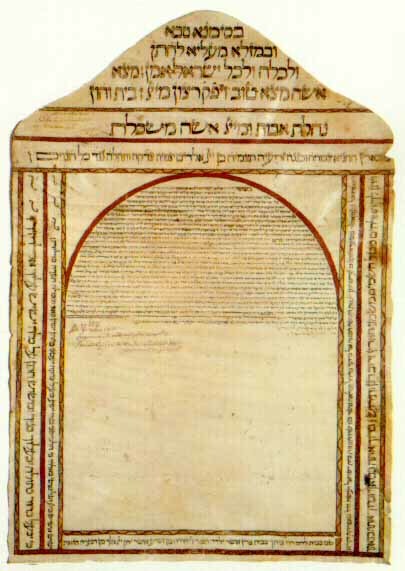 The decoration is calligraphic, inscribing verses from the Books of Isaiah and Ruth which speak of bridegroom, bride, rejoicing, and blessings, (Ketubah, Corfu, 3 Heshvan, 5573 (1812), Hebraic Section, Library of Congress Photo). 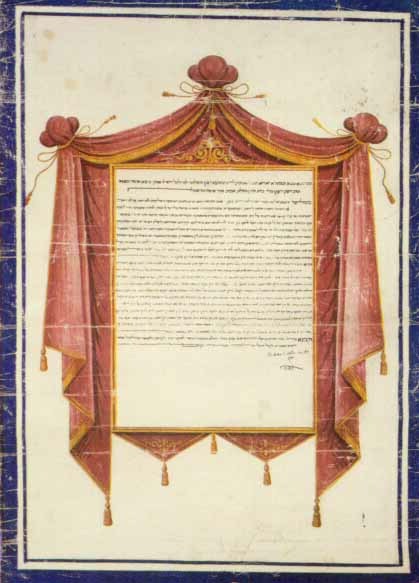 This ketubah follows the unique tradition of Corfu ketuboth in dual reckoning of time, from the creation of the world and the destruction of the Temple, but it departs from the Italianate rococo style of ketubah illumination in use in Corfu at that time, as may be seen in the 1804 and 1819 ketuboth in the Israel Museum. What makes this departure more striking is that both the De Osmos and the De Mordos were old and well-known families in Corfu's Italian Jewish community. The blessing with which Isaac blessed his son Jacob is followed by the blessing with which his neighbors blessed Boaz, when he took Ruth as his wife. The Lord make the woman that is come unto thy house like Rachel and like Leah, which two did build the house of Israel ... and let thy house be like the house of Perez, whom Tamar bore unto Judah, of the seed which the Lord shall give thee of this young woman. The "seed" that came of the 1812 wedding was the bridegroom at another De Osmo-De Mordo wedding, this one in 1835, when Raphael De Osmo married Rembizia De Mordo. In content, these are twin ketuboth, though twenty-three years apart. But styles had changed, as life changed; life was quieter in 1835 than it had been in the war year 1812. A renewed exuberance of spirit and artistic style produced a colorful ketubah, framed by a yellow and orange decorative border, adorned by flowered cornucopia and flowers and geometric designs. In 1835 another De Osmo-De Mordo wedding was celebrated, Raphael to Rembizia. Calligraphy gave way to decoration; flowers and geometric designs in color were used to frame this ketubah, (Ketubah, Corfu, 1835. Hebraic Section, Library of Congress Photo). The third Corfu ketubah, written in 1874 for the wedding of Joshua Raphael Eliasoff and Hannah Belleli, is framed by full wine-colored drapes. The Bellelis were among the early Greek families on the Isle. Under the Greek constitution the Jews were then enjoying equal rights. The carefully arranged, symmetrical lush drapes exude bourgeois well-being. They would perfectly fit in the room of the family celebrating the seder, depicted in the rare Haggadah published in Corfu in 1877, of which the Library has a fine copy. Sixty years separate the three ketuboth. Yet the texts remain the same, except for the names of the celebrants and the dowries brought. Through their ornamentation, however, the ketuboth provide indications of the changes wrought by political, social, and cultural developments in the life of the Corfu Jewish community in the nineteenth century. This 1874 Corfu ketubah's decoration is rich looking, symmetrically folded drapes, done by professional hand. The artist seems to wish for the bridegroom, Joshua Raphael Eliasoff, and his bride Hannah Belleli, a well-ordered, richly endowed, harmonious life together, (Ketubah, Corfu, 1874, Hebraic Section, Library of Congress Photo).